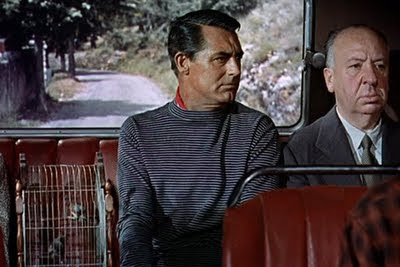 As his cameo shows, Hitchcock clearly put a lot of thought into the making of To Catch a Thief. Last Saturday I proposed that Alfred Hitchcock’s films can be viewed as philosophical treatises, written with a camera, not a pen. 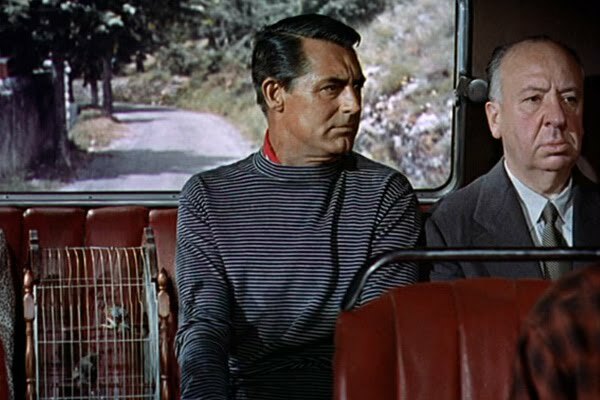 Using To Catch a Thief as a case in point, I suggested that this movie explored the relationship that an actor has to his or her role in film, as opposed to the stage. Here are a few more thoughts. When a film explores that relationship, it enters the realm of film as philosophy. TCaT pushes deeper into what it means to be a film actor. Just about every character in the movie is acting a role to some extent. And they do so with an explicit agenda of deception. Thus, a consideration of actors, screen acting, authenticity and deception all play into the film. The movie concerns Robie, a former jewel thief nicknamed the Cat, who has been falsely accused of committing a recent spate of burglaries around the resort town of Monaco and must clear his name or be sent to prison. Although Robie has retired from his criminal past, many insists that he is still active and is lying about it. They maintain that his life as an honest citizen is only an act. This seems to provoke indignation from the girl Danielle (Brigitte Auber) and the rest of the former Resistance workers in her father’s circle because they are implicated in his supposed thievery. When one of the resistance members is killed, the police seize on the opportunity to identify him as the Cat in order to present an appearance to the public that they have solved the case. Justice is not their aim; for them the mere pretense suffices. Frances (Grace Kelly) and her mother (Jessie Royce Landis) put on their own show, using their wealth to live an aristocratic life that conceals their true, more humble origins. Although they own up to the ruse, that isn’t enough. They, along with the insurance agent H. H. Hughson (John Williams) get pulled into the act when they don costumes to attend a masquerade ball; Highson spends the evening disguised as an African slave in order to convince the police that he is Robey in disguise. Like a matrushka doll, he wears a disguise within a disguise. (Is the triple H in his initials a sly wink at the triple identity he takes on in this scene?) In each of these cases, these characters act one part or another as part of an agenda of deception. In order to catch the real burglar, Robie must engage in some play-acting, by seeming to reprise his role as the Cat. Eventually, this leads to the film’s climax where he scrambles cat burglar-like across a rooftop, chasing the real Cat, who turns out to be Danielle. She reveals that she is part of a plot involving those former resistance workers to burglarize the community and to blame Robie – thus, their supposed indignation at him was also a mere performance! In all of this deception, I see a direct relationship to the nature of film. By striving for verisimilitude, filmmakers attempt to deceive viewers into thinking that the images projected onto a white screen aren’t images at all, but the thing in itself. This kind of deception is just what happens onscreen in TcaT. I’m going to wrap these thoughts up tomorrow, or, perhaps, the day after.